The shield is in the form of two "C"s with touching tips. The body of the specimen is severely warped and contorted. The surface is cut and scratched, probably due to physical wear, and split in several places. 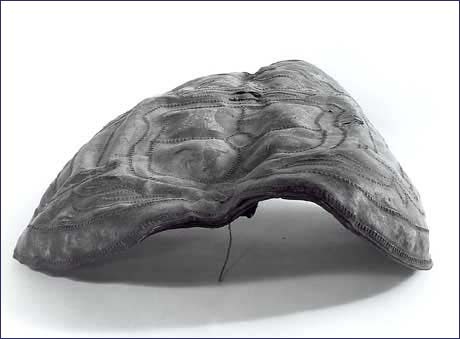 To the reverse side are attached, at the top and bottom center, two small sections of leather, presumably supports for the thongs which were held by the bearer.